After the collapse of Affliction Entertainment in August 2009 ended the co-promotion between Affliction and M-1 Global, Fighters.com Heavyweight Champion “Last Emperor” Fedor Emelianenko (31-1) and his M-1 Global management team never approached UFC President Dana White about Emelianenko joining the UFC, M-1 Global President Vadim Finkelchtein recently told Fighters.com through a translator. But, when White came requesting Emelianenko fight in the UFC after Affliction’s collapse, Emelianenko and Finkelchtein graciously decided to press the reset button on the relationship. Besides, Affliction had switched allegiances seemingly overnight to partner with the UFC and left M-1 Global without a partner with which to co-promote Emelianenko’s fights. But, Finkelchtein now regrets that decision. Emelianenko and Finkelchtein laid out their requirements for Emelianenko to fight in any promotion, even the UFC. Their demands were much the same as during the previous negotiations, and did not include a request for 50% of the UFC (as White has claimed). It’s important to Finkelchtein for everyone to recognize that Emelianenko is not a free agent, and was not during the negotiations with the UFC. Emelianenko is contractually obligated to M-1 Global, as well as a stakeholder in the MMA promotion. Any fights featuring Emelianenko must be co-promotions with M-1 Global, per Emelianenko’s contract with M-1 Global. Global’s legal rights to promote Emelianenko’s fights, negotiating as if Emelianenko was a free agent. It is Finkelchtein’s right to enforce Emelianenko’s contractual obligation to M-1 Global, just as it was White and the UFC’s right to sue “The Natural” Randy Couture (17-10) when Couture tried to wriggle free from his contract to fight Emelianenko in 2007 and 2008. White defended his legal rights to promote Couture; and, Finkelchtein will defend his legal rights to promote Emelianenko. 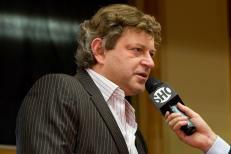 But, then White took his frustrations to the media and made claims about the UFC’s offer to Emelianenko and Emelianenko and Finkelchtein’s demands that are false, according to Finkelchtein and M-1 Global. mind, he never asked to do business with the UFC, nor does he need the UFC to make money promoting Emelianenko’s fights. So, why would White ask Emelianenko to fight for the UFC, then insult Emelianenko and Finkelchtein and lie to the media when White refused to meet the demands White knew were required? It was as if White set them up. Finkelchtein is aware that his and Emelianenko’s story hasn’t been reported in the MMA press, and expressed frustration to Fighters.com. “I sent answers to Sherdog, but they weren’t published,” Finkelchtein claimed.